The past, present and the future ow into one another.... a lively hope for our future is rooted in our past. Rev. Msgr. John B. Szymanski, P.A., V.G. We, the parish community of St. Thomas the Apostle, trace our beginnings back to the year 1921 when the Catholic families of the Old Bridge area were provided with a church building that was to serve as the center of their religious life for the next fifty years. The new church, a product of the pastoral vision and inspiration of Father William A. Gilgillan, pastor of Our Lady of Victories in Sayreville, was probably blessed in the late fall of 1921 by Bishop Thomas J. Walsh, Bishop of Trenton. It may even have been named in honor of the Bishop’s patron saint. It was essentially a mission church when it was first dedicated, a practice that was part of the pastoral strategy of the Catholic Church. Mission churches were constructed so that parishioners would not be required to travel a long distance to their parish church for religious services. Also, mission churches were erected in locales where in time there presumably would be a sufficient number of Catholics to warrant an independent parish – that is, one which would have its own resident pastor and sufficient members to sustain its life and ministry. The incorporation of “Saint Thomas Church, Old Bridge, N.J.” actually took place on November 21, 1932 and in 1941 Bishop William Griffin, the sixth Bishop of the Diocese of Trenton, established Saint Thomas the Apostle as an independent parish. He appointed Father James Stephen Foley as its first pastor. Under Father Foley’s brief pastorate, St. Thomas grew large enough to see another parish spun off from it: Corpus Christi, which was established in 1944. 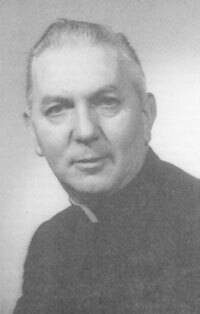 Father Foley was succeeded by Father Edward Henry who had an even briefer stay, but who directed a number of repairs in the church, hall and rectory before being transferred in 1948. And Father Henry also saw the establishment of a new parish develop from St. Thomas. In 1946 Immaculate Conception Parish was started in Spotswood. He was succeeded by Father Walter A. French. In response to the growing number of parishioners, most of whom were families with young children, in November of 1957 Father French purchased 11.7 acres of land in Madison Township along Highway 18 to serve as the site for a new parish church and school. In 1959, also in response to the growing numbers, St. Bartholomew Parish of East Brunswick developed from St. Thomas. The school also got some help from the Parent Teachers Association. With the encouragement and leadership of Father French, in 1960 and 1961 the PTA promoted a parish-wide effort to gain a new school bus for the school through what has been called “The Great Green Stamp Collection.” It took 18 months to acquire and paste into books the 5,000,000 S&H Green Stamps necessary to purchase a 66-passenger school bus, which arrived in the parish parking lot on October 7, 1961. The nuns who taught in the school eventually moved into two houses on Barkley Road, which served as their convent; three other houses on Barkley served as rectories for four parish priests and weekend assistants. And, as St. Ambrose Parish in Old Bridge was formed from the burgeoning St. Thomas population, much was happening in our church as well. St. Thomas and its grounds were continually being upgraded. 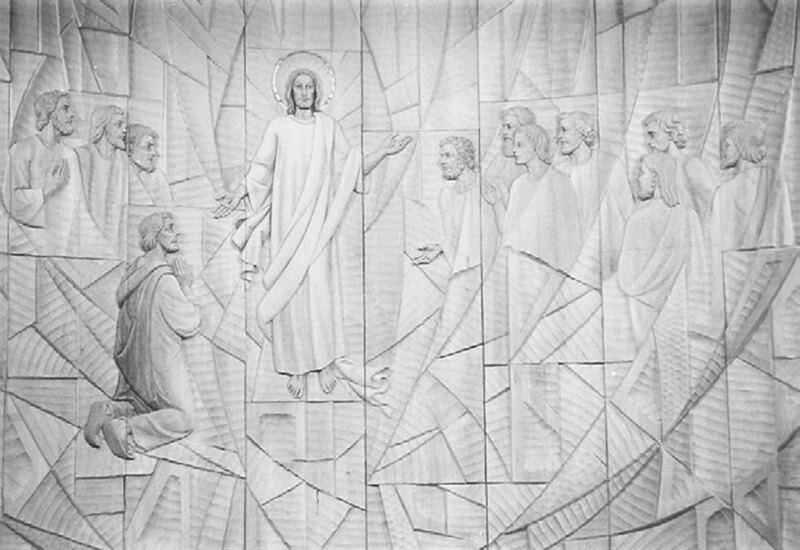 In 1963, the school’s Parent Teacher Association financed installation of a reredos screen featuring a 12-foot crucifix in the center of the sanctuary. Stations of the Cross were added to the church and convent. A granite statue of St. Thomas the Apostle was placed in front of the auditorium and, on the main church lawn, a statue of St. Ann with Mary as a young girl. The outdoor shrine to Our Lady of Fatima was constructed by volunteers. The eight-classroom addition to St. Thomas School was completed in time for the beginning of the school year in 1966. Father French had initiated what became and remains the semi-annual Blood Drive. The Saint Vincent de Paul Society, Legion of Mary, ushers, and altar servers developed and grew. During the 1970s, parish organizations flourished. 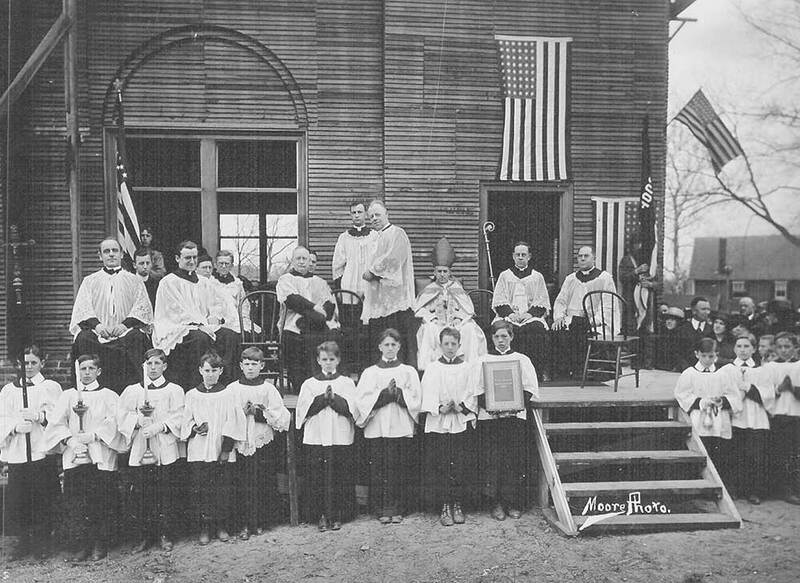 The Holy Name Society met monthly on a Sunday morning following Mass. On Fridays, members staffed Bingo games. The Rosary and Altar Society cared for the church sanctuary and sponsored fashion shows and dances. During the spring of 1971 the first Parish Council came about, comprising 15 elected members and 7 appointed members. In 1971, the clergy and council initiated plans to celebrate the parish’s silver anniversary. They chose the slogan, “Fifty Years Young” for an observance on November 20, 1971. Bishop George W. Ahr was principal celebrant. In preparation for the anniversary, a parish coat of arms was designed and stained glass windows were installed in the church. Nine large windows feature symbols of the seven sacraments; the corporal and spiritual works of mercy; a scene from the life of Saint Thomas the Apostle; and a window depicting the Immaculate Conception as the Patroness of the United states, flanked by the coats of arms of the Diocese of Trenton and our parish. The small windows over the doors commemorate the first Saint Thomas Church, the present church and school, and the Apostolate of the Laity. As a direct effect of Vatican Council II, many, many lay people have served the Saint Thomas parish community, helping to implement reforms brought about by the council. They have been involved in the parish choirs, liturgy committee, evangelization committee, as Eucharistic ministers, lectors, greeters, and part of the RCIA Team, Suburban Woman’s Club and Senior Citizens. In 1970, responsibility for teaching CCD transferred from the Daughters of Divine Charity to a number of lay volunteers. This, too, was largely a result of Vatican II. Adult faith formation and youth ministry also developed during this time. 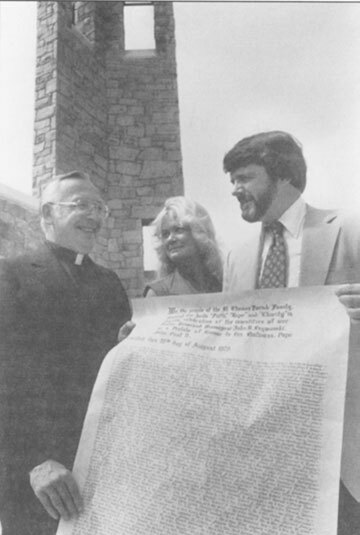 Monsignor Szymanski being presented with the scroll containing the names of parishioners who contributed to the special collection to cover the cost of the Bells of Saint Thomas. In March 1979 another construction project began, giving the exterior of the church building a distinct "ecclesiastical" appearance. The design included construction of a bell tower. The timing was fortuitous as, early in June 1979, Pope John Paul II named Father Szymanski a Prelate of Honor. As a surprise tribute to the new Monsignor, the Parish Council, under the leadership of Martin Idler and Eileen Tabert, asked the members of the parish to contribute to a special collection to cover the cost of the bells. More than $10,000 was contributed and three cast iron bells from Holland were installed and rung for the first time at the Easter Vigil on Saturday, April 5, 1980. In November of 1981, Bishop John Reiss of Trenton came to lay the cornerstone of the new Pastoral Center. He dedicated the building and was principal celebrant of a Mass of Thanksgiving. That same month, Pope John Paul II established the new diocese of Metuchen, on November 19, 1981. Bishop Theodore E. McCarrick was named first bishop of the diocese. He named Msgr. Szymanski to serve as chancellor and vicar of administration for the new diocese in early 1982. Msgr. Szymanski was later named vicar general. 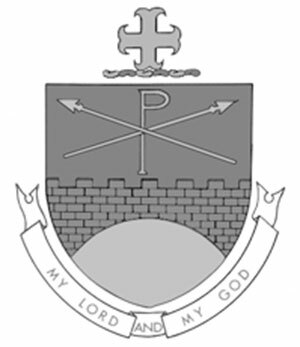 In 1986, the Parish Council adopted a Mission Statement for the parish. Slightly amended, it appears weekly on the Sunday Parish Bulletin. This statement originally provided a foundation on which the Parish Council could develop immediate and long-range parish goals. A further upgrade of the parish in 1986 involved a chapel of reservation to house the tabernacle, construction of a semi-circular sanctuary wall with a statue of the Resurrected Christ temporarily hung there, and installation of a pipe organ. Bishop Edward Hughes, as second bishop of Metuchen, formally dedicated the church on February 21, 1987. In 1989, the parish set upon “The Church Beautification Appeal” to allow for the addition of two wooden sculptures designed and sculpted by Edmund Rabanser of Ortisei, Italy. The Holy Family sculpture for the main church lobby was installed in August 1990. The sculpture for the sanctuary, of Saint Thomas the Apostle encountering the Risen Christ, arrived in October 1990 and was installed following the direction of Edmund and Georg Rabanser. The Inaugural Mass celebrating the 75th Anniversary of Saint Thomas the Apostle Church was celebrated at 12:30 p.m., Sunday October 22, 1995. Monsignor Szymanski was principal celebrant and homilist. Father Kevin Casey was concelebrant.